You’re busy; I get it! You have much to do in the day, from marketing your business to dealing with your clients. And because of the many tasks that befit your day, you might make the decision not to attend any business events that are happening at home or away. But here’s the thing. While you shouldn’t go to every meeting you hear about or get invites to – you would never get any work done, otherwise – you should still make an effort to attend some of those that are suited to the industry you are involved in. They are not, as you may be prone to thinking, a waste of time. Business events are your opportunity to meet and listen to people who may be more experienced and qualified than you are. From listening to expert public speakers such as Jinhee Wilde to taking part in training workshops, you might get to learn something that you wouldn’t have otherwise if you decided to stay rooted in your office. This will benefit both you and your business. This is your opportunity to meet potential customers and clients. Go armed with your business cards, shake a few hands, and hold conversations with those people who may be interested in what you have to offer. And make your brand stand out by setting up a display stand that passersby will be unable to miss, perhaps with examples of your products, and guided tutorials in how to use them. 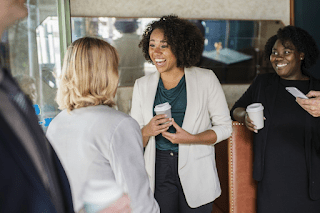 People are more likely to use a business that they have personally connected with, and you can make this happen with your presence at the event. It’s difficult to keep tabs on your competitors when you’re stuck indoors, but by getting to an industry event where people in your line of work are attending, you can clue yourself up on what they are up to. You can benchmark your level of success against theirs, and if you discover that they are doing something better than you, you can then take what you have learned and use their innovations (or go one better) within your business. By attending an event, you are increasing your visibility in the business world, and people will get to know who you are, and what you can offer them. You might meet somebody you can partner or collaborate with, or you might get invited to speak at another event if you have shown your expertise. These opportunities will benefit your business, so despite the expense of travel and registration, the doors that open up for you as a result of an event are more than worth it. Finally, attending a business event is a good opportunity to break up your day or week. You will get to meet new people, learn something new, and quite possibly, have a lot of fun in the process. And let’s not forget the buffet spread! Better than your usual packed lunch, anyway! We all need variety in our lives, so by getting out and doing something different with your time away from the slog of your routine, you might then increase your motivation and productivity when you’re finally back in the office.